If your attorney has assured you that it was slander, why do you need to hire experts to enter into the exploratory stages of a lawsuit? I got this in e-mail earlier today, referring to the story we discussed earlier where they were criticized by CNN. Please copy your letter before you hit the send button on CNN's website, and paste it in the box on the AE911Truth.org "Contact Us" link. We'd like to compile your missives and display them with your name on our website. Support AE911Truth's exploration into direct legal action against CNN. Our attorney has assured us that CNN has clearly stepped over the line in an act of slander, which carries legal ramifications. We need your financial support to hire the experts to enter into the exploratory stages of a lawsuit. This case could very well become the best opportunity yet to place the WTC evidence into the legal record through the discovery process and yield a dramatic win for 9/11 Truth over the entire mainstream media. Yeah, I'm hoping they do. Grab the popcorn and watch another idiotic Truther legal case go down in flames. How many times have we heard that before? Four (or is it five?) Loose Change films, 9-11 Mysteries, Zero, the Core of Corruption, Blueprint for Destruction, Painful Deceptions... the list goes on and on. I love that bit about how the puffs of dust from the floors below the collapse wave was the easiest to spot. I have discovered something amazing about my bicycle pump: when I push down on the handle, air comes out of the hose. Must be a controlled demolition happening in there somewhere! Gage claims that members of Architects and Engineers and Secretaries at Architectural Firms and Subscribers to Architectural Digest and Railroad Engineers for 9-11 Truth were interviewed for the film; just from the few clips I have seen it appears that Hooper snipped bits from Box Boy's Explosive Demolition. He's apparently going with the big tent approach; he was interviewed by Kevin Barrett, who's mostly persona non grata with the supposedly responsible wing of the Truthers, although I don't know if they ever existed. Not hard to see the part where the CT nutbars who support some alternative theory will latch onto to discredit him; early in the interview (4:20) he claims that his lifelong best friend is an FBI agent. The Troofers hate it when we use this word, but it's not like insane or non compos is any gentler. Anyway, one of my general tasks when I see a name as listed among the Troofer community that I have not seen before is to look them up for indications of insanity. So today I'm looking at a rave review of 9-11 in the Academic Community and I start Googling the names of the folks involved and came across Barry Shainbaum. Adnan Zuberi (BMath '10), Mike Bondi (BASc '94), Hadi Izadi (PhD '10, Electrical Engineering) and Barry Shainbaum (BSc '71) created the award-winning documentary film 9/11 in the Academic Community, which follows the academic discourse on the origins of the war on terror. One day at age 18, Barry was watching TV with his girlfriend when, out of the blue, he hallucinated that he was on the show. He’d been on TV before, but no, this wasn’t Tiny Talent Time. He fell into a catatonic state; he couldn’t talk. No one could figure out what was wrong. There was a stay in a locked psychiatric ward. He’d swing between episodes of delusion and periods of focus and achievement. In his 20s, while at university, he was driving to an appointment when he hallucinated he was a cop. He actually got the car in front of him to pull over and the woman in it to produce her driver’s licence. He was wearing an orange tank top and cut-off shorts. Barry let her go with a warning, then drove himself to his psychiatrist’s office, where he talked unstoppably. The point is not to laugh at these folks for their mental health issues, but to note that they do exist and that they make up a very high percentage of the movement. I got an e-mail yesterday from the AE911Truth jokers. Yeah, somehow I ended up on their mailing list. Hmm, it has been a while since I took algebra in 7th grade, but if they have collected under 35,000 signatures in 5 weeks, and there are just over 3 weeks left until the end of June, in what mathematical system are they "on pace" to reach their goal of 70,000? 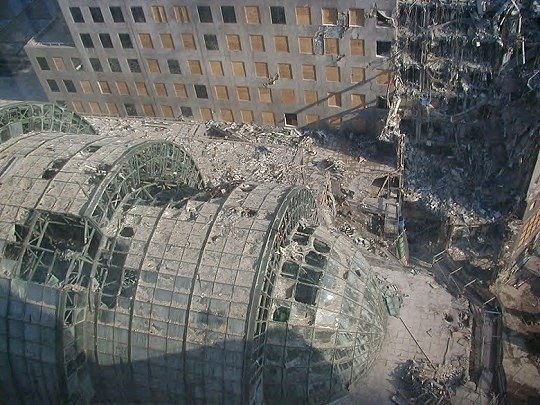 From the beginning, the official 9/11 Pentagon story caused cognitive dissonance, since the visual evidence suggests that nothing as big as a 757 could have hit the outside wall of the Pentagon and disappeared even more completely than the planes that hit the World Trade Center, where they burned until the WTC collapsed around them. Absence of evidence is not evidence of absence. The alternative stories posit a missile or specially rigged small plane hitting the Pentagon. There is no known physical evidence to support such stories. According to Snopes.com (as of April 2008), these stories are false. Much of the evidence collected by government investigators remains secret. Absence of evidence is not evidence of absence. "In this essay I asked what conclusions about the Pentagon attack were supported by physical evidence – primarily post-crash photographs of the site. I found that, in every aspect I considered, this evidence comports with the crash of a Boeing 757. At the same time, the evidence does not conclusively prove that the aircraft was a 757, much less that it was Flight 77. However, that lack of conclusiveness should not be surprising given the systematic suppression of evidence by authorities." As you can probably guess, that "determined debunker of 9/11 skeptics" is anything but. It's Jim Hoffman, whom we last heard from proposing that the controlled demolition of the World Trade Center was accomplished with explosive ceiling tiles. 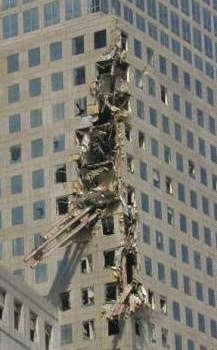 The videos of those three buildings coming down make it 'obviously obvious,' even to a brain damaged individual, such as myself that it was a controlled demolition; carefully planned and executed by high level individuals. Their only mistake, as far as I can see, was to make the fall so clean and perfect; or maybe they wanted to intimidate and terrorize and cow us into submission and passive acquiescence by shoving the facts in our faces. On the other hand, maybe they were more interested in avoiding "collateral damage" as they didn't want to damage their buddies' buildings. Note as well the comments that are voted up and down; not too hard to guess that William Boardman's theories on the Pentagon are popular with the readers there, despite the fact that the supposedly responsible Troofers have all disavowed the no-757 at the Pentagon theories.